This Doom "reboot" of sorts seems to have reinstated gamers' faith in id Software, which was never going to be an easy task after the lackluster Rage (which I actually liked quite a bit) and John Carmack's departure. 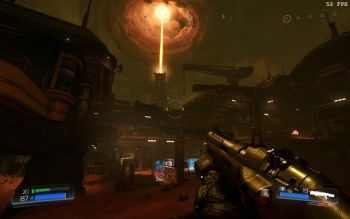 Some have even called Doom 2016 a retro shooter, adopting a definition whereby "retro" refers to anything they happen to like and anything "modern" is automatically considered a flaw. A retro shooter Doom is not, however. While the first few maps have more backtracking and a bit more open-ended layout than shooters these days tend to have, the game very quickly turns into something resembling the new Shadow Warrior. What this means is that as the game progresses it relies more and more on sealing the player inside big rooms resembling deathmatch arenas where he must fight wave after wave of demons until allowed to continue. The good thing is that combat in this game is quite fun. 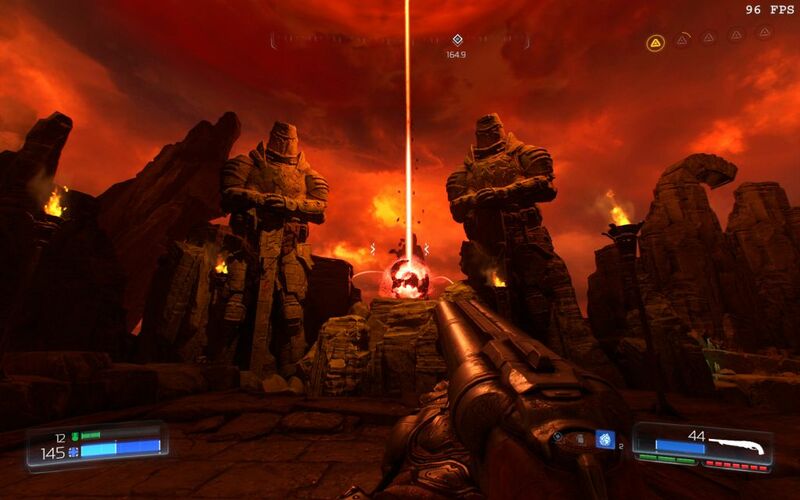 There are tons of weapons without any out-of-place carry limitations, all the classic Doom monsters make a successful comeback and the game's got that badass attitude the old, post-Keen id is known for. 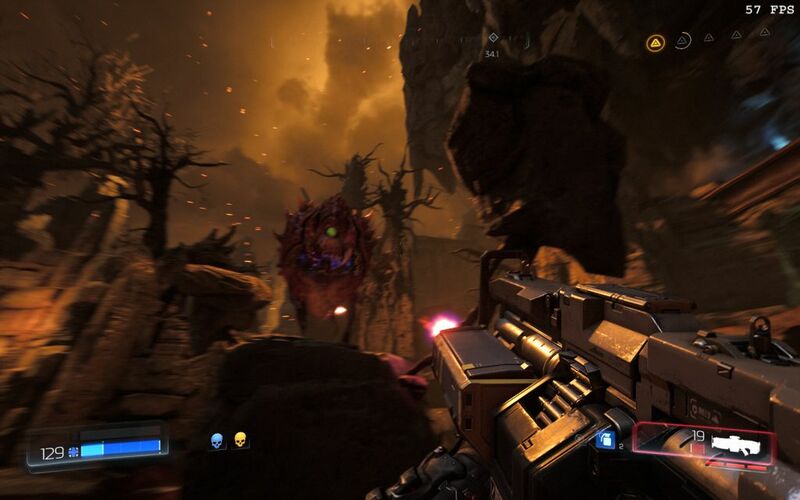 The Doom marine, or whatever he is in this game, is more of a ninja than Lo Wang got to be in Shadow Warrior (2013). He moves fast, climbs ledges as if it were his second nature and performs double jumps. This means that you have quite a bit of mobility on you as you navigate your way around the game's combat areas. Moreover, at least on Ultra-Violence the difficulty level was just perfect (including boss fights where I experienced most of my deaths, I died around ten times), keeping you on the edge of your seat constantly. The game relies solely on checkpoints, which is a good thing as "savescumming" is a feature of '90s shooters that should stay in the '90s. After all, checkpoints only encourage you to play better rather than half-assing everything in frustration. Also, since the game relies on health pickups rather than regenerating health, there are even fewer cheap ways out; you have to keep your eyes open for those medipacks and try to make do with what you're given. "Glory kills" are also encouraged as these yield health and ammo. The game has many things going for it beside combat. Even the almost fully linear maps later on have many well-hidden secrets, ranging from armor upgrades to pointless collectibles, so exploration remains a thing all the way to the end. Everything from weapons to abilities can be upgraded, which is another feature id seems to have borrowed from the recent Shadow Warrior. The maps look pretty gorgeous with tons of details and awesome-looking environments even if they lean heavily toward the generic. I did find the Hell segments somewhat disappointing though, being a bit too reminiscent of the canyon maps in Rage (particularly its The Scorchers DLC). 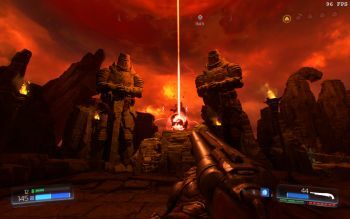 The rather unsettlingly abstract Hell of the original three games is still the best, with Doom 3's more stereotypical Hell a close second. As for performance, the game gave a consistently smooth framerate (around 60-100) on R9 380 (4GB) and FX-8350, but I did get a few abrupt crashes-to-desktop. 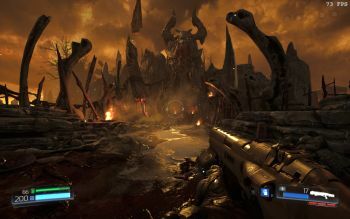 There's also music in this game, which is pretty rare these days but it fits the pace of the game perfectly and pays homage to many classic Doom tunes. But while Doom is a fun game, ultimately it suffers from the same problem as Shadow Warrior did; it gets repetitive quite fast. There isn't much in the way of a story and there's absolutely zero variation in gameplay. There are no puzzle segments, no driving segments, no story segments; it's just pure, unadulterated action from the getgo. Of course, that's Doom for you but for a ten-hour game it's just too much of the same thing. There's a multiplayer mode and a primitive map editor, but I haven't really taken a good look at these yet. The multiplayer mode seems fun in short bursts but it suffers from the same thing as all arena shooters; it gets boring quite fast because run & gun is the only way to play it. Moreover, it's a bit too random and less skill-oriented than previous id multiplayer games. Conclusion: Doom 2016 essentially takes the core gameplay of Shadow Warrior 2016, makes some adjustments to it – especially in terms of added mobility and that intangible "attitude", and changes the setting to Mars. 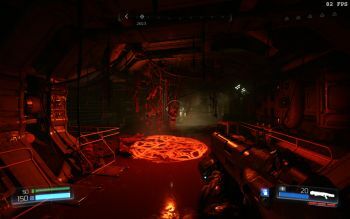 Moreover, Doom seems to have learned all the right lessons from both retro and modern shooter mechanics. Still, this game is extremely combat-oriented. 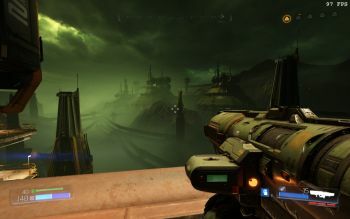 There's nothing approaching the atmosphere of Doom 3 – in my opinion still the better of these two – so if you're looking for an experience that goes beyond blowing things up, then Doom is not going to be your thing. I'm actually not much into this type of games anymore but I still managed to find this new Doom refreshing, at least so long as I limited myself to playing around two maps a day so as to avoid having tedium set in.